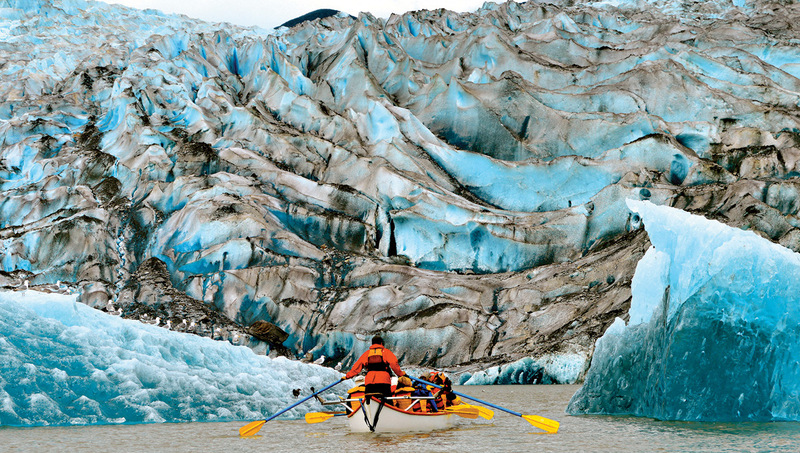 Paddle alongside the remarkable Mendenhall Glacier! Tour includes round-trip transportation from dock, quality raingear and life jackets. Snack includes hot beverage (on cold days) and water plus reindeer sausage, salmon spread, cheese, and crackers. 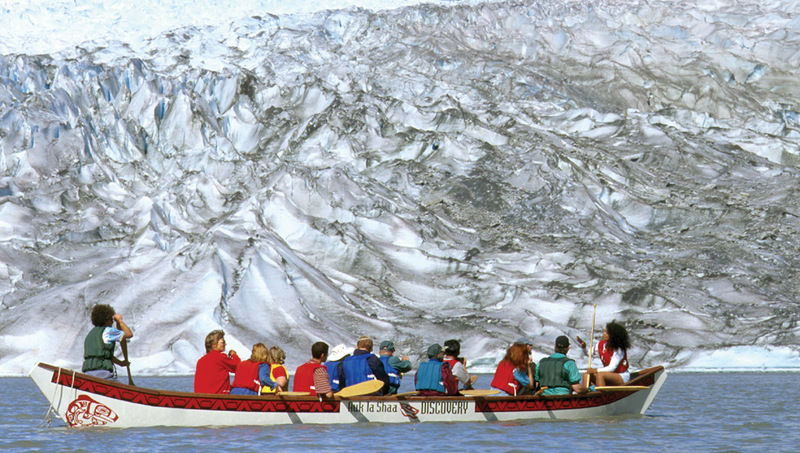 Be among the select few, under a limited USFS permit, to travel by canoe for an unprecedented experience near the face of the magnificent Mendenhall Glacier. 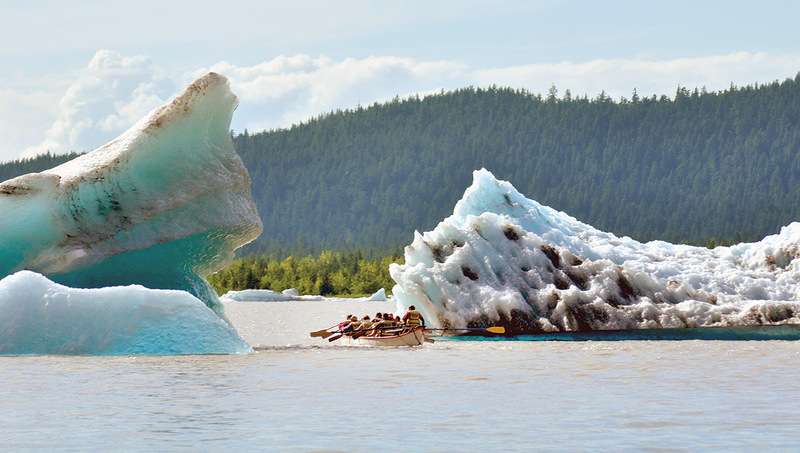 Surrounded by one of the richest samplings of Alaskan wildlife you’ll find anywhere, navigate past icebergs in a 20-passenger, Tlingit-style canoe surrounded by one of the richest samplings of Alaskan wildlife you’ll find anywhere. Birds, including arctic terns, nest on the shoreline, eagles, goats, salmon and bears can all be seen. 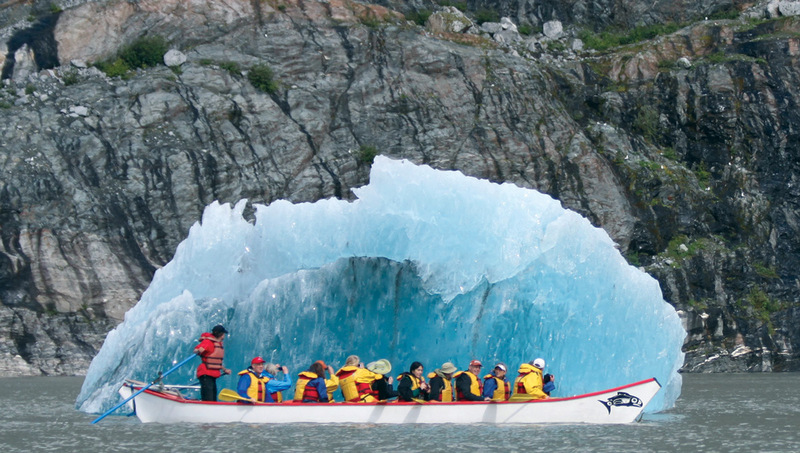 Your experienced guide will navigate the canoe within a safe distance of the face of the living glacier before venturing past the rushing water of Nugget Falls. Beach your canoe at its base where you will disembark to refuel for your return paddle with an Alaskan-style snack. Notes: We recommend guests to wear warm comfortable layers and bring gloves and an extra pair of socks. Moderate to good physical condition is necessary for participation in this excursion. Children must weigh at least 40 pounds in order to fit into required life jackets. Children 12 and under must be accompanied by an adult. Children ages 13-17 must have a signed parental consent form to participate in the absence of a parent or guardian. This tour operates under a special use permit with the USDA Forest Service and is and equal opportunity provider. 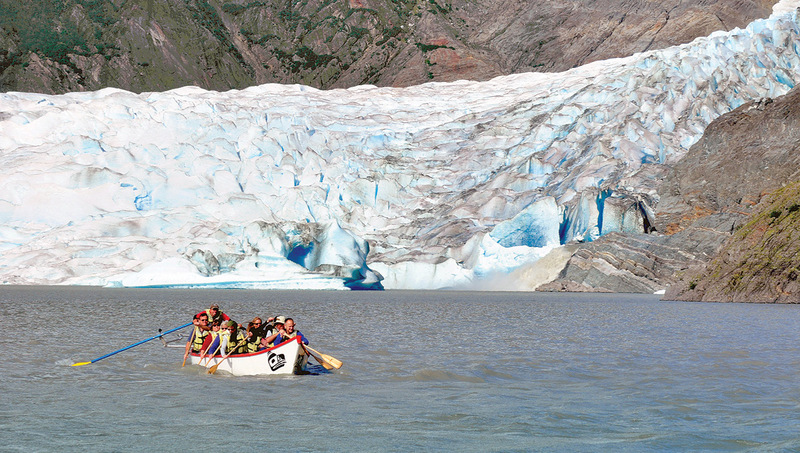 Paddle across Mendenhall Lake, navigating past icebergs, surrounded by one of the richest samplings of Alaskan wildlife you’ll find anywhere. Birds including Arctic terns nest on the shoreline, and eagles, goats, salmon and bears may be seen. 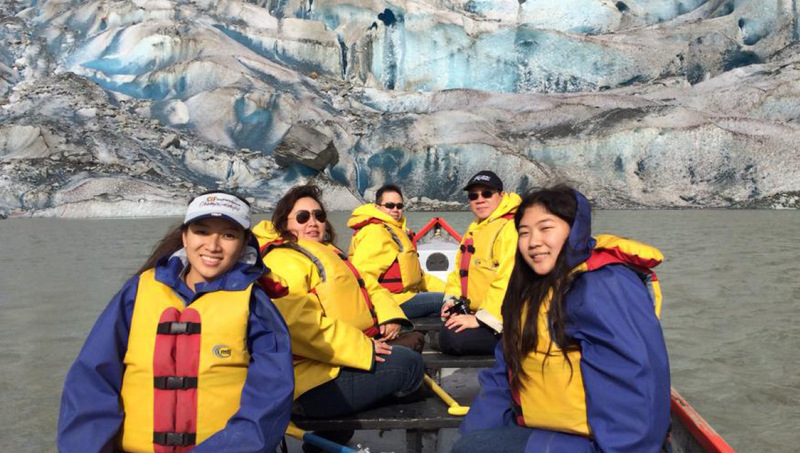 Then, venture within a safe distance of the massive, awe-inspiring face of the living Mendenhall Glacier. 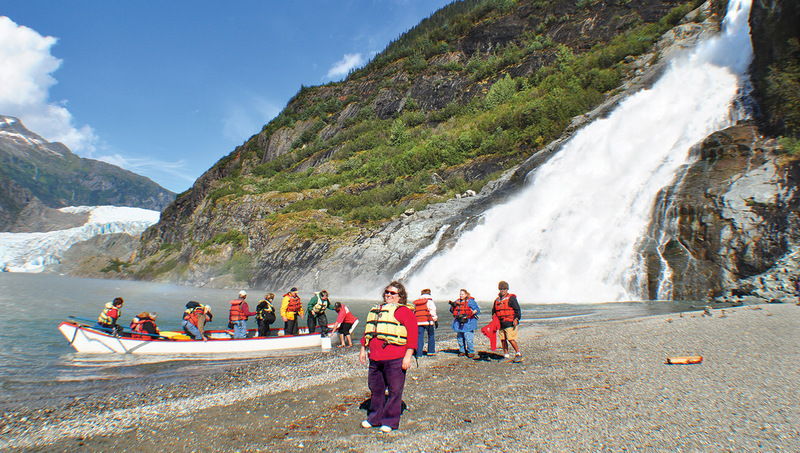 Grab a thrill ride by skirting the base of beautiful and powerful Nugget Falls where you will head ashore to refuel with a snack of Alaskan-style fare for the return. 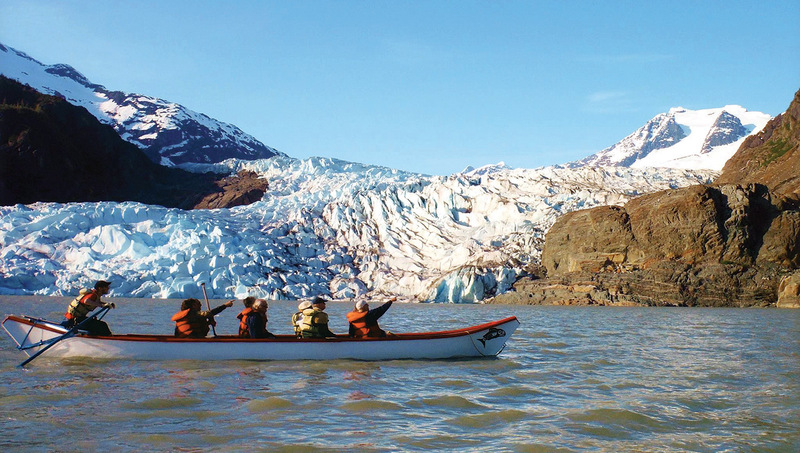 You’ll make your trip in a traditional Tlingit-style canoe, an exceptionally stable 28-foot watercraft, with all modern safety gear supplied. Because of the close approach to the glacier face, the Forest Service tightly controls the number of participants. Be one of the lucky few to experience this one-of-a-kind adventure.